Our lives are so busy! Schedules, tasks, responsibilities, obligations and more take up all of our time. How can we even hope to hear God’s voice in all the noise? We barely have time for self care or hobbies, let alone quiet time with God. However, hearing His voice is vital to our survival in this chaotic culture in which we live. 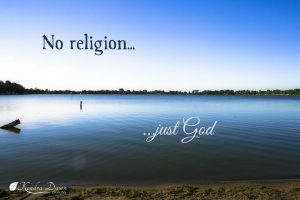 We simply must get away from it all, even if just for a few minutes, to try and reconnect with God. It’s not about religion, confession, masks, and being good. It’s about a relationship with Him. When we step away from the chaos and into the solitude and stillness and we listen, we can finally hear His voice. We hear Him tell us how much He loves us. We hear that He’s proud to call us His children. We find out what His plans are for our lives. He shows us areas we need to work on, and areas we can stop trying so hard. He has so much to tell us. We just need to listen and we can’t do that while we’re surrounded by chaos. Go for a walk. Take a drive. Take five minutes. Steal a half an hour. Escape for an afternoon. Plan it. Put it in your schedule or it’ll never happen. Write it in pen. Set an alarm. Refuse to let other things encroach on that time. It’s vitally important to your faith walk. Step away into the stillness and listen for His still, quiet voice. He wants to meet you there. http://kendradawndesigns.com/wp-content/uploads/2014/10/Fl_No-Religion.jpg 532 800 Kendra http://kendradawndesigns.com/wp-content/uploads/Leaf-White-156px.png Kendra2014-09-07 20:42:412016-11-24 04:13:16No Religion, Just God.